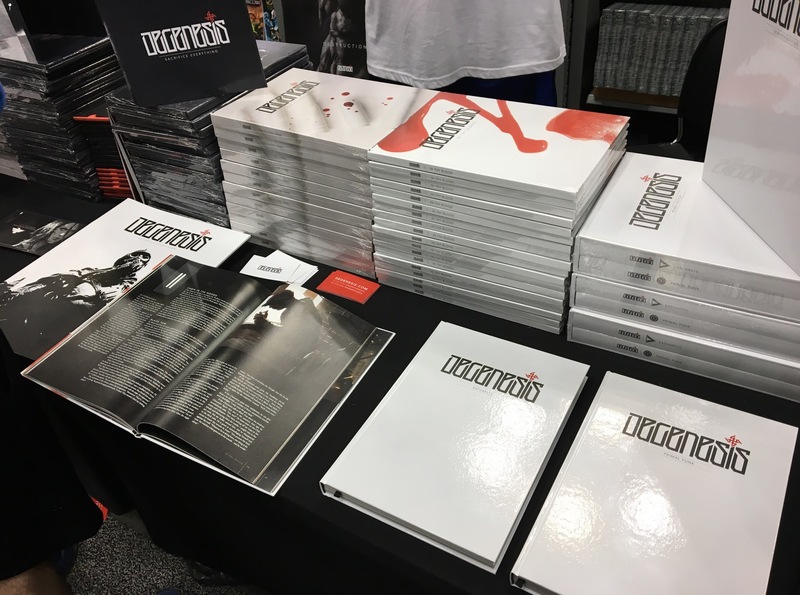 The Livingdice Gencon 2017 Vendor Report covers those exhibitors that caught my eye. 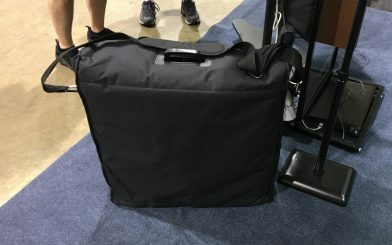 Given 500+ vendors came to Gencon 2017, I cannot hope to cover them all. I apologize in advance for those vendors I omit. I applied no real criteria for this report, these are just fascinating offerings that deserve your attention. 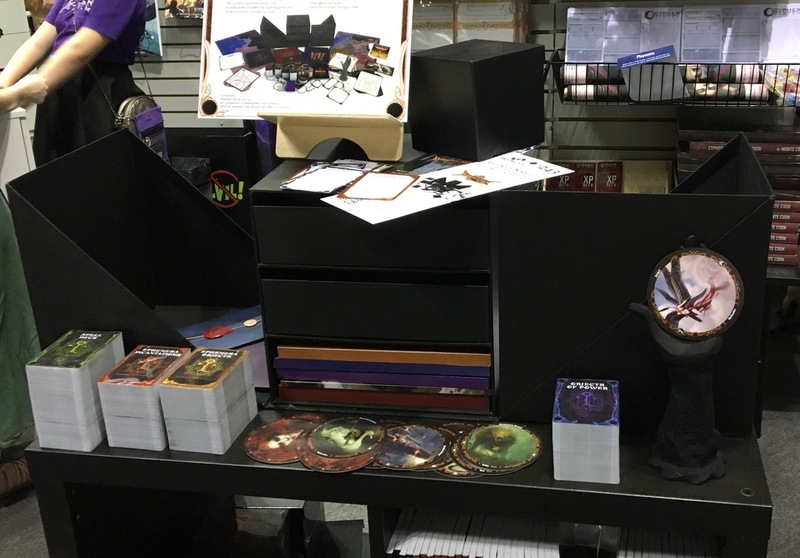 Game Anywhere was in the board game hall and not the vendor hall, so likely some missed it. 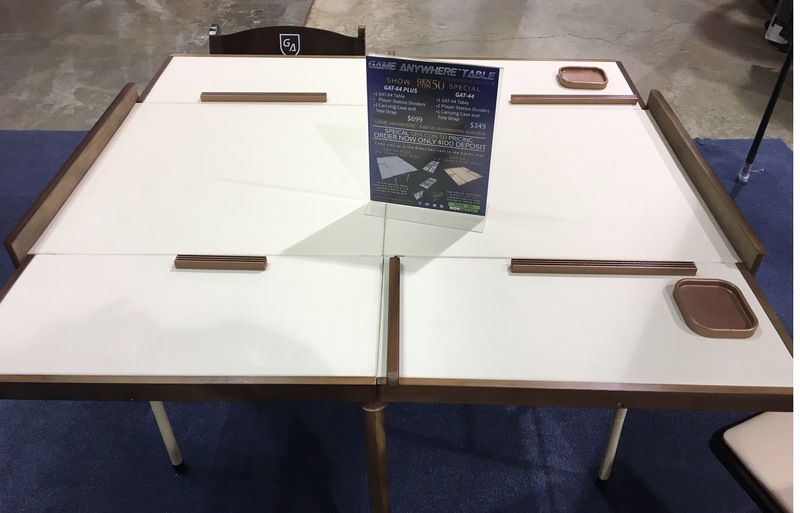 Game Anywhere produces a line of folding, metal game tables. 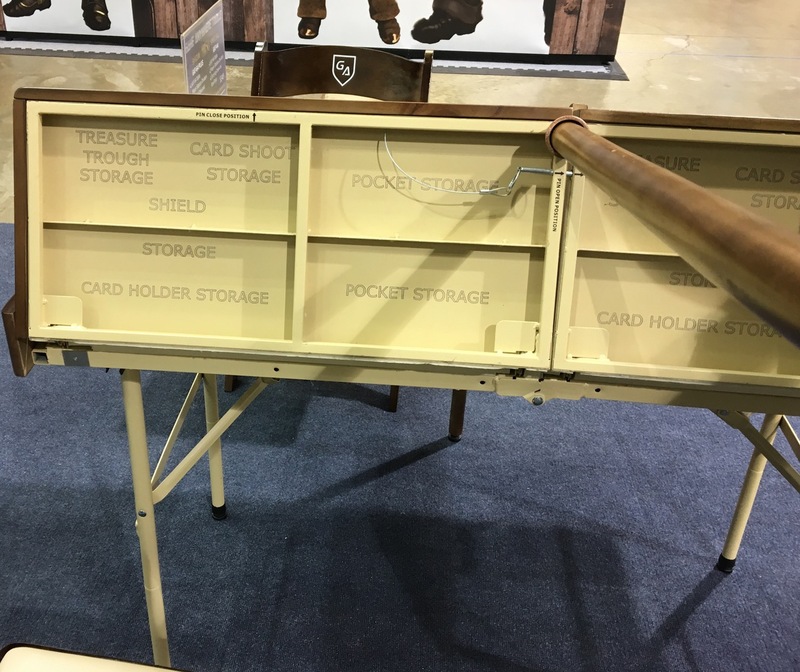 Unlike conventional game tables, this one folds down to a luggage-sized package for easy storage. I saw these online some time ago but wrote them off because I thought them too flimsy. My mistake. They are made of steel and I made a point of giving them a good jostle to simulate the “gamer bumped the table quakes” that all too frequently destroy miniature games. They are stable and heavy enough that I see no issue with running a regular game on them. 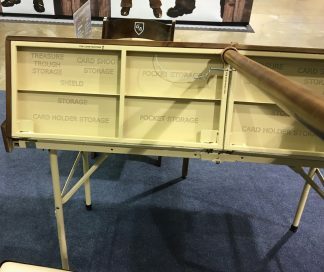 Additionally, the tabletop is entirely magnetic and the accessories offered (trays and the like) adhere to the table or the bottom when it is in storage(see image above). Overall I was impressed and see many applications for gamers with limited space or wives that will not allow a more permanent style of game table. If anyone has one and runs a game regularly on it, I would like to hear how it performs in real world conditions. I bought in big to this game during the Kickstarter and the project proceeds at a reassuring pace. Behold, the (incomplete) Black Cube! And this is only a fraction of the total game! There are enough books to fill all of those drawers in development. This releases next year and I expect it to be one of the most impressive RPG launches in history. 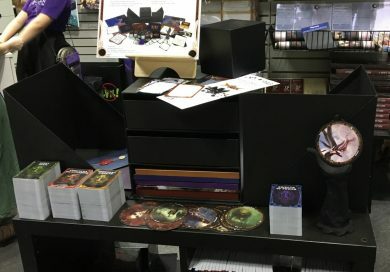 Elderwood Academy has had products reviewed on Livingdice.com before, so regular readers are familiar with their line of high-quality dice and game boxes. However, this item was so interesting I had to share it. They call it “That Floaty Thing.” It rotates! A European import RPG, the game books boasted amazing art, a post-apocalyptic story and an interesting approach to the rules. Rules were contained in short stories, rather than bullet points. I did not get to play it (I want to) but it is definitely on my play list for next year. If I get in a game, I will post a review. 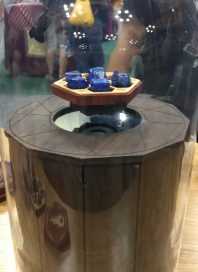 Rocket Pig Games displayed an amazing line of .stl files for sale at the convention. Yes, the picture is of miniatures, but Rocket Pig does not sell miniatures. .STL files drive 3d printers, so rather than selling miniatures, Rocket Pig sells the 3d printer files. You can make your own miniatures at home or send them to a 3d print shop and have them made. 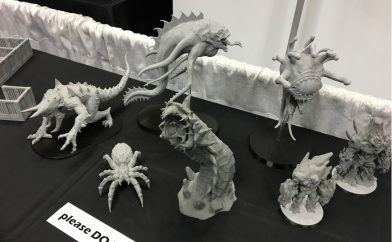 I truly believe that 3d printing is the future of gaming miniatures and market disruption is inevitable. Plus I thought the models were very well done. More Gencon 2017 vendor reports in part 2!